Hey dear readers, I am back on track with blogging! Sorry I have been busy for the past few weeks (yes, in my “Hiatus” post I wrote “two weeks or so” but it ended up almost 1 month, oops! ), but I would like to give a huge THANK YOU! to all my readers who have been constantly checking back on my blog. I seemed to have also gained a couple of new readers in the process. Hmm, maybe I should have more “hiatuses” like this! Kidding! I do miss blogging, though. 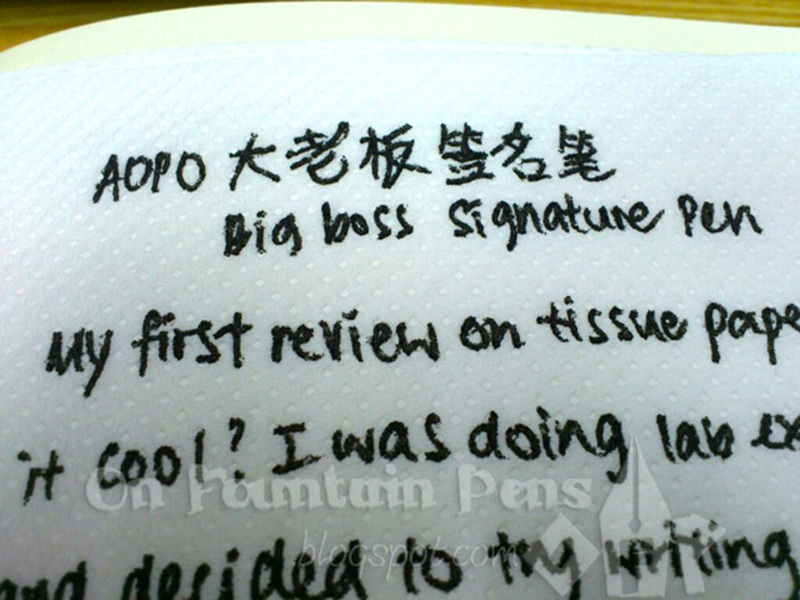 The AOPO Big Boss Signature Pen. 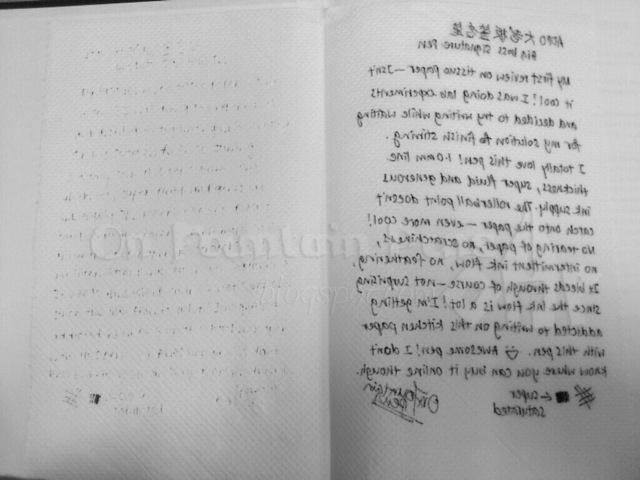 And yup, the sample was really written on a piece of tissue paper. Or rather, a disposable kitchen napkin. 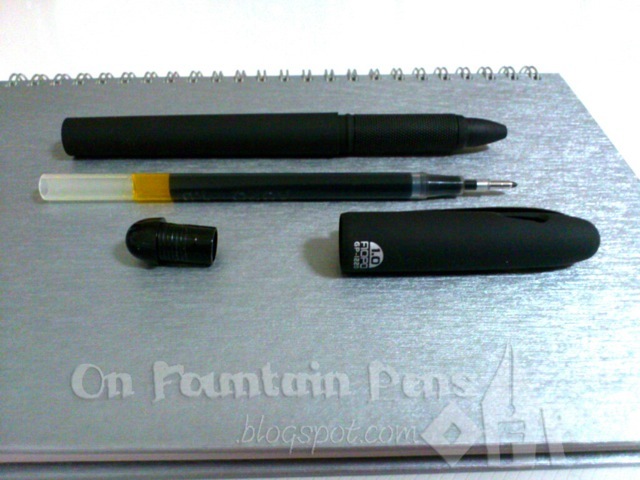 The pen is medium-big, black, rollerball, and silky-smooth. That’s probably the most apt sentence I can ever speak of about a pen. I did a frantic search online to find nothing but a chinese website selling the pen in bulk quantities, with the minimum price exceeding S$2.50. Not sure if it is even worth it to buy so many of that (I do have quite a number of other pens waiting for me to use, though). It was nothing short of disappointing. Readers, if you ever find this pen in any corner of the world, please drop me a line and I will see whether I am able to get it in my hands or not. Or just send me about 20 of them right away! 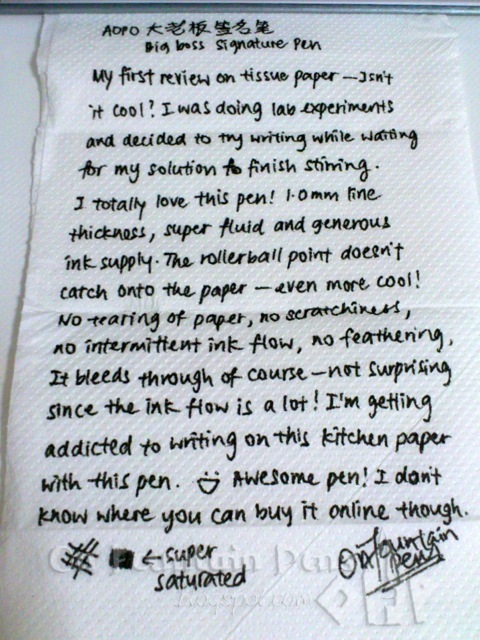 As for the writing experience, it is awesome and it even writes well on a kitchen napkin, the disposable kind. Don’t ask me why I had that crazy idea to write on a kitchen napkin. It just came as a brainwave when I was watching my experiments in lab and waiting for them to finish up. We use disposable napkins to clean up minor spills, and this clean piece was just lying around, so I just scribbled on it. The nib does not catch on the fragile napkin, and I can write normally on it, like I am writing on paper! This can give you an idea of how smooth the nib is. From my experience of using it, I have never encountered inconsistent ink flow, starting problems, or skipping. AT ALL. In addition to that, it bleeds through badly over to the reverse side. This is nothing to be freaked out about, though, considering the absorbent and thin quality of kitchen napkins in general. The bleed-through is quite consistent. 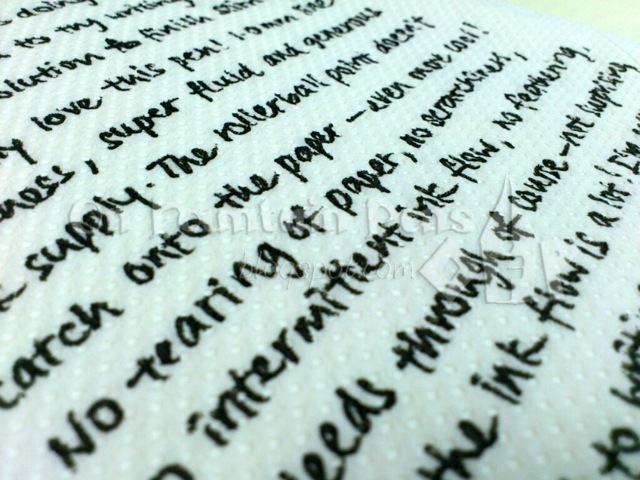 It actually creates a nice effect, like a “writing on super thin, fragile and translucent paper” kind of effect! Consider this if you want to write a note on some special paper to a friend. Or maybe, if you just wish to scribble your number and slip it into someone’s pocket, this pen can be a good choice, with an appropriate kitchen napkin, of course. Needless to say, this pen is smooth on all other papers I have tried it on. You hardly need any effort to produce a thick, consistent line. Probably the only downside of the writing experience is that it lays down so much ink that it takes some time to dry, so for a leftie like me, it means smudg-smudg-smudging! But even I am not concerned about this. So why should you? 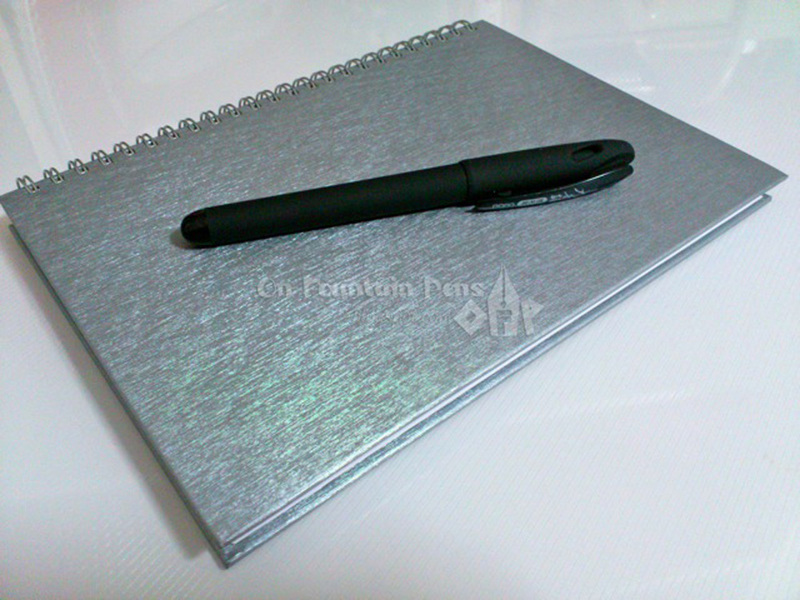 Of course, I tried to propose alternatives such as fountain pens, but he was not interested in them, so I didn’t say more. Is it convincing enough? I hope it is. So, is anyone ready to creep at every corner to look for this pen? Don’t forget to get me a few of them! 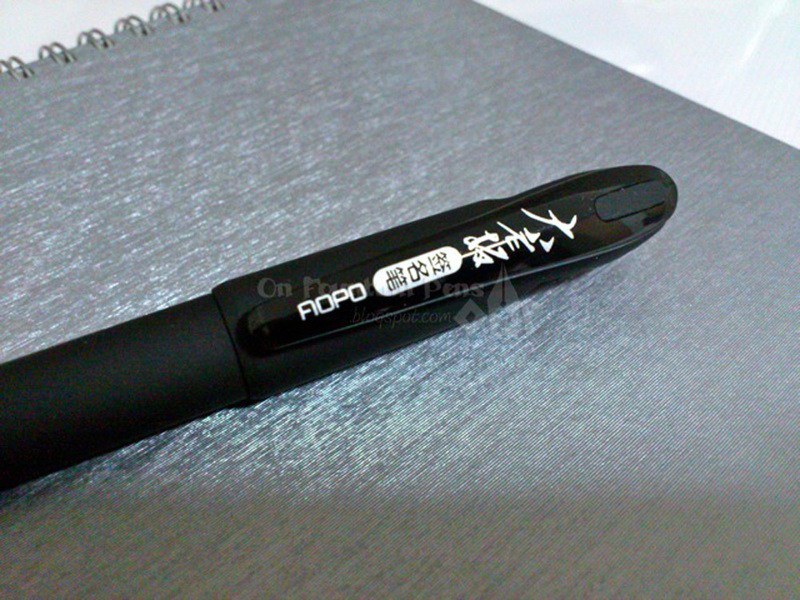 Baoke and M&G (other Chinese brands) make some similar 1.0mm pens with the same large size gel refill. If they’re not available locally, there are some on ebay. Thanks, Mike! Lol poetic aren't you? It's really too bad, but well, it motivates me to buy more pens to find a suitable replacement for it lol. Best I could find was this "http://officeworks.lk/Pens-pencils-markers.html&quot; – but I think the only AOPO stuff they do is highlighter pens. It's a shame you found a pen you love so much and now you can't replace it. You'll just have to savour every last stroke of the nib, until it's all used up…and then dream of pens gone by (sorry, getting a bit too poetic now). lol try random bookstores? or pen shops?